It is save to say I invested at least one man year in the development of Tumble Panda. A game that had a very simple concept in the beginning but gained complexity with progress and graphical design. I changed the way levels are edited until I finally ended up with a combination of Tiled and Inkscape for the design. I used AndEngine as game engine and Box2D for physics. For skeleton animations, such as the Panda, the bamboo and trees we used Spine, which is available for $69 in the Essential edition. Graphical design was made by Subphisticated and background Illustrations by Darren Herminghaus, for an undisclosed medium four-digit amount. Sound design was provided by my friend LeTryp, for the great price of $0. Total cost of development: A medium four-digit amount plus $69 and a lot of time. On this blog I wrote 6 articles about the game or specific areas of the game. 174 people became membery of the beta testing group on Google+. 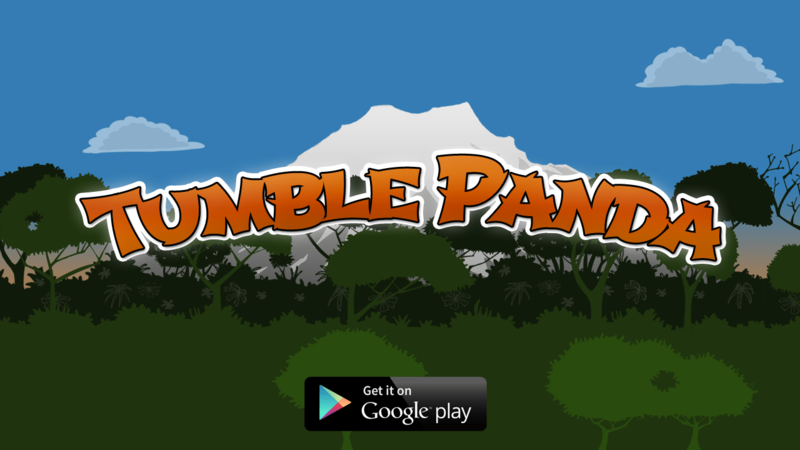 Tumble Panda was published to Google Play on July 7th. I published news about the release to 161 blogs, 23 Facebook groups, 52 Google+ groups and in 25 forums. I sent a newsletter announcing the release to 429 subscribers. I played around a bit with ad networks as well and spent $220 on AdMob and, after seeing almost no result, another $200 on AppBrain, which I much more very satisfied with. I also planned to spend about $3800 in advertising material which madvertise owes me, but they did not reply to my requests, which left me with an unsatisfied feeling. Shortly after the release we announced TumblePanda.org and two weeks after the release, we published the first update with four new levels. Both of course was also communicated in the forums, on this blog and in another newsletter. Total cost of marketing: $440 plus, again, a lot of time. Tumble Panda was reviewed by four different blogs. The release newsletter was actually opened by 24 people, the tumblepanda.org newsletter by 40 by. The game was downloaded an additional 120 times in its first week. Today, it has been downloaded 2,002 times. The ad income from AdMob since July last year was a whopping ~$12.75 (eCPM $0.99). Tapjoy made us $0.33 and Google Play ~$1.11. So, judging by download numbers and financial success, it is save to say that Tumble Panda was a failure. It took much too long to finish the game. I had already sketched out the basic functionality in the end of 2011 and had the first larger iteration with my designer in 2012. It was the first game I have ever developed, so a bit of a learning curve had to be expected. Still, it was exhausting not to finish a product for such a long time. The timing of publishing the game could not have been worse. I was in Japan back then and moved back to Europe only four days after the launch. I was in a bit of a timezone problem, with Tokyo being 13 hours ahead of New York and 7 hours ahead of Berlin. Being jet lagged wasn’t very helpful either. I started marketing too late. In hindsight it would have been much nicer to keep a development diary and involve a broader audience from early stages on. My marketing budget was too small. Way too small. In the end, after the development was done and almost all the money was burned, there was not much left to spend. I had to sacrifice my time to generate new income from other sources. Still, I learned a lot. Let’s take a look. Google plus converts really well, especially for beta testing. Of all the people I asked to join the Tumble Panda Beta, Google plusers responded the best by a huge margin. This is due to the fact that there’s no big barrier for them to join a beta, they are often affine to technology and most likely connected to me because of my profession as an Android developer. People don’t like to open newsletters when you are asking for something. A later newsletter, simply announcing a new app store optimization article, converted much better with 63 people out of 446 opening it. When developing a game, use a cross platform engine. I used AndEngine, because at the time Unity was in its infancy and libraries like libGDX were not supporting iOS yet. Getting one or more additional eco systems for free or with minimal extra effort is a no brainer. Focusing on smaller projects until you have found a suitable niche is a good way to go for a small budget. Implementation beats everything. Giving a product to customers or testers early on, analyzing their behavior and feedback and then deciding on what to do next will guide you in the right direction. To get some money I started working for clients again. Being a freelance Android engineer is an easy way of earning a generous amount of income and is what I am still doing at the moment. I will be moving to Japan in July and therefore started a new blog, which you can take a look at on Japanese-Journey.com. If you are interested in Japanese culture, traveling or the Japanese language, take a look. Right now I’m writing two articles per week, one on a random topic and one Japanese Challenge. My goal is to grow it to 10,000 views per month (at the moment it is at about 2,000 views/month). I also have a plan for this blog. I want to re-develop one of my existing apps from scratch. What I’m planning to do is involve you in every part of the project development process. Starting from competitor analysis, over selecting features, monetization, architecture and development. Marketing strategies and their implementation, product launch, update strategies and financial results. Now, if you are interested in seeing this kind of posts here, please let me know in the comments. Also, if there’s anything special you want these reports to cover, please let me know. Do provide those development posts on /r/androiddev reddit! thank you for your comments. I’ll do that. Thank you so much for having the bravery to post your income.I’m just starting my journey into making money from mobile apps and I have to admit the number here make me scared. Have you tried monetizing this site? Well, sometimes you land a hit and sometimes you don’t. I monetized this site some time ago, by sponsored articles and ads. Now I don’t.